Inspiration from all that lovely spicy food we ate in Singapore! I love chilli!!! Being raised in a Sri-Lankan family, we were exposed to spicy food at a young age. So, when one of my neighbours kindly provided me with an abundance of homegrown chillies, what did I do? Make chilli paste of course! You can use this chilli paste in your cooking or on top of your favourite dishes. Steralise a jar to store paste. Discard seeds and membrane of chillies. Place in a food processor with sugar salt and crushed garlic. Add enough vinegar to keep the paste moving and blend to a smooth paste. Add salt. Place paste into steralised jar and pour a layer of oil to cover the top of the paste. Seal and store in the refrigerator. The paste will store well in the fridge. Thanks for such a useful recipe. I never thought of making chili paste before. Nice. Thank you. I was looking at my chilli plants this morning and wondering what to do with all the chillis. Well you will have to just make it yourself Pooja. It’s hard when international products are limited. Hot stuff! That’ll kick start any meal. Glad you liked it. Do you cook your chillies? I know some recipes actually cook the chilli first! No, I don’t cook the chillis before I grind them into a paste with other ingredients so it’s painfully raw and fresh 🙂 But sometimes I would briefly fry the paste and use it as part of a base of a curry. I don’t really know of any recipes that cook the chillies first. Would that render the paste less or more spicy I wonder? My neighbour who kindly gives me the chillies, cooks his paste and it actually takes away some of the heat! This looks amazing and I can’t believe I’ve never thought of it before! Pinned too! Ooh! You put garlic in yours! Must make it extra spicy! I think spicy is really nicey! 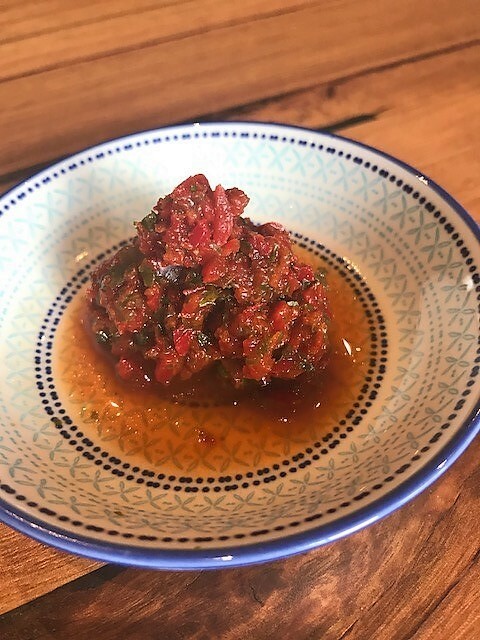 I never knew making chilli paste was so simple – now I have the recipe, all I need is a neighbour with an abundant chilli plant! I like to cook, but I’ve never considered making my own chili paste before. Thanks for sharing the recipe with all of us! I’m pinning it for future use! This is one of those simple recipes that leaves me embarrassed to have never thought of making the thing myself. Now I know how easy it is, there’ll be a jar of homemade chilli paste in my fridge at all times!